I’m excited to announce that Uber has acquired Otto, a 90-plus person technology startup whose mission is to rethink transportation, starting with self-driving trucks. 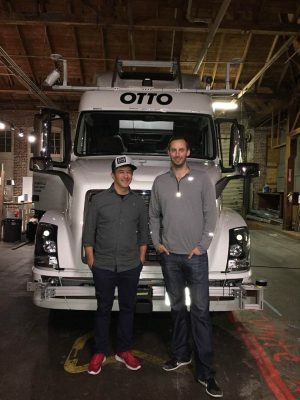 Anthony Levandowski, Otto’s co-founder, will now lead our combined self-driving efforts reporting directly to me—across personal transportation, delivery and trucking—in San Francisco, Palo Alto and Pittsburgh. If that sounds like a big deal—well, it is. More and more the world of atoms is interacting with bits. In order to provide digital services in the physical world, we must build sophisticated logistics, artificial intelligence and robotics systems that serve and elevate humanity. When it comes to this advanced technology stack, Otto plus Uber is a dream team. Anthony is one of the world’s leading autonomous engineers: his first invention, a self-driving motorcycle called Ghostrider, is now in the Smithsonian. Just as important, Anthony is a prolific entrepreneur with a real sense of urgency. Together, we now have one of the strongest autonomous engineering groups in the world; self-driving trucks and cars that are already on the road thanks to Otto and Uber’s Advanced Technologies Center in Pittsburgh; the practical experience that comes from running ridesharing and delivery services in hundreds of cities; with the data and intelligence that comes from doing 1.2 billion miles on the road every month. In the last six years we’ve seen the profound impact that smartphone technology has had on transportation, as well as the delivery business. When people can push a button and reliably get an affordable ride across town, things change for the better—and quickly. Ridesharing helps cut drunk driving. It complements public transit, getting people to places that other means of transportation don’t reach, replacing the need to own a car over time. Most important of all, the smartphone has made mass carpooling a reality. By getting more people into fewer cars, we can reduce congestion and pollution in our cities. Of course, this is just the start, especially when it comes to safety. Over one million people die on the world’s roads every year and 90 percent of these accidents are due to human error. In the US, traffic accidents are a leading cause of death for people under 25. This is a tragedy that self-driving technology can help solve. That’s why our partnership with Swedish car maker Volvo, which we’re also announcing today, is so important. Volvo has consistently been a leader when it comes to safety. And partnership is crucial to our self-driving strategy because Uber has no experience making cars. To do it well is incredibly hard, as I realized on my first visit to a car manufacturing plant several years ago. By combining Uber’s self-driving technology with Volvo’s state-of-the art vehicles and safety technology, we’ll get to the future faster than going it alone. Here’s to a great partnership with Volvo. And to Anthony, Lior and the Otto team—welcome to Uber. We’re pumped to have you on board. It’s time to move.